To avoid damage to your flasher battery during off-season storage, charge it every 30 to 60 days. That will ensure reliable sonar next winter and for years to come. Over time, all lead-acid batteries will lose their charge. Without regular re-charging, even the highest quality battery can become so damaged it will refuse to take a charge. Worse yet, it could appear to take a charge, only to fail on the ice, rendering your sonar unit unusable. 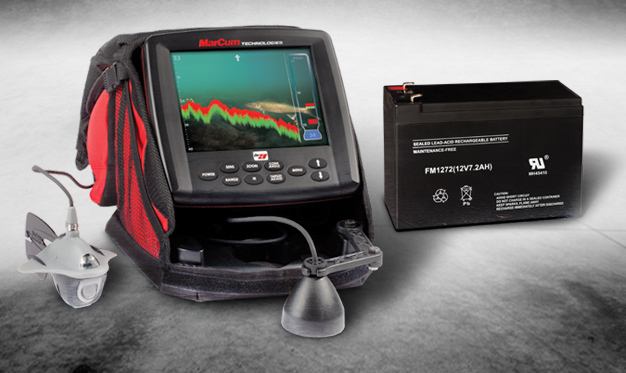 After charging your battery every 30 to 60 days during the off-season, leave it disconnected from your sonar unit. Doing so ensures that a stray current draw won’t slowly drain its charge over time. Before storing your MarCum this off-season, inspect it closely for missing parts, like gimbal knobs, snow shields or transducer cord grommets. Any of those small parts can be easily misplaced in the field. Ordering a replacement now guarantees you’ll have your MarCum ready for action at the start of the next ice season. Time For A New Transducer? Although your MarCum’s transducer is designed to work perfectly for many years, it can wear out prematurely if you crack open iced-over holes with it, or drag it across the ice on a too-long cord. If your sonar doesn’t seem as sensitive as it once was, it might be time to order a new transducer. They are available online here. “There’s no time like the present to replace this critical piece of equipment,” Holst says. This entry was posted in Tips and tagged Brad Hawthorne, James Holst, MarCum, Will Roseberg. Bookmark the permalink.